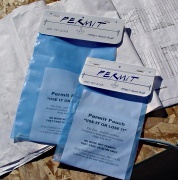 Permit Pouches specifically designed to keep Plans and Permits clean, dry and highly visible. Specifically designed to keep Plans and Permits clean, dry and highly visible. Highly endorsed by Building Inspectors and Contractors throughout the United States and Canada. Permit Pouch offers you more visibilty, more exposure plus all weather protection of your valuable permits and plans. Permit Pouch (US Patent # 5,267,643) is UV protected while Permit Pouch Extreme (patent pending) offers more strength. Click on a category below to view Permit Pouch products.